Simple never looked so luxe.. 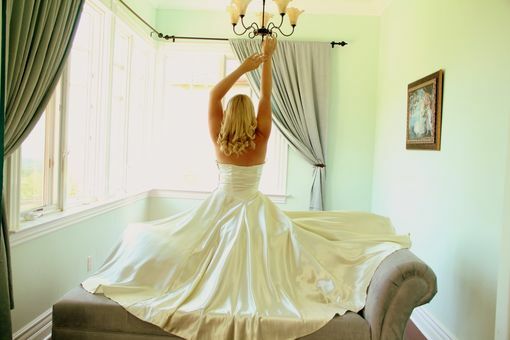 I can certainly imagine marilyn sauntering down the aisle in this very dress! 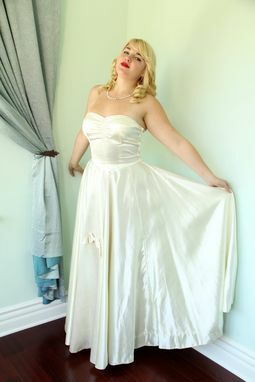 This stunning one of a kind couture 50s bridal gown is made from thick, sumptuous Dutchess Silk Satin with gathered center on the bust, satin covered boning in the bodice, a dipped "V" waist in front and back and the most beautiful double full circle skirt! The dress is so very flattering, giving an hourglass shape to your figure, emphasizing a small sleek waist, and full hips. I added bead work to both the neckline (all the way around) and the satin bow which is attached to the skirt. The beading includes Swarovski crystals, twisted Japanese glass, and genuine freshwater pearls! You will not find another gown like this, especially not in this rare bombshell size! Zips up the side with its original metal zipper in perfect working condition, as is the rest of the dress. Payment Plan available! Please ask if you have any questions!